Production started in Australia in 1966, two years before it ended in England. The early Australian Mokes were very much like the last English Mokes. Australian production lasted until 1981 (16 years). This was longer than the Moke was built in England (5 years) or in Portugal (13 years). Australia also produced the most Mokes and the most significant developments in the car’s history. Some features are outlined below, but this is only a guide, not a comprehensive list of dates and facts. You should also remember that any Moke may have been modified over the years. English Mokes and the early Australians were basic, lightweight, ‘minimal’ cars. In Australia, as the Moke was developed, it was ‘beefed up’ with bigger wheels, bigger engines, better brakes and roll cages. The bigger wheels (13 inches) also came with a wider track and higher ground clearance, so tackling rough ground was less of a problem. The Australian production used a number of local parts not common with contemporary European Mini saloons. But these differences do not present major problems to keeping an Australian Moke on the road. Very first were 850 cc, but others were 998cc, 1098cc and 1275cc. Engine number prefixes were 8, 99, 10 and 12 respectively. Radiators were larger, and the ‘top’ hose entered at the end nearest the windscreen, rather than at the end at the front. This meant a different design of thermostat housing compared with ‘normal’ Minis. Early Australian Mokes had the same long, shallow-angled, gear lever as the English Moke, from an oval-shaped opening in the centre/top of the tunnel, close to the ‘toe panel’. This set-up was later changed to a Mini-style ‘rod change’ remote gear-shift (as introduced on Minis in 1973). The lever was more upright and came from a square-shaped opening offset to one side of the tunnel and set slightly further back. The lever was still a stretch - it couldn’t be nearer the driver because the handbrake was in the way; and the handbrake has to be ahead of the seats as there’s no space between them. So the Moke uses special gear change rods, shorter than those used on the Mini (and longer handbrake cables). A large, hefty, sump guard was fitted to the sub frame to protect the power unit. Initially 10 inch diameter, but these were soon changed (in 1969) to 13 inches. This was a major change which also affected the rear suspension and bodywork. The standard 13 inch wheels were plain pressed steel, but the 1977 ‘Californian’ came with attractive 8-spoked ‘Sunraysia’ steel wheels in white. Drums all rounds, or front disc / rear drums if the 1275cc engine was fitted. On cars with 13 inch wheels, the drums had a built-in spacer in the casting. Master cylinders and the pressure distribution valves (bolted nearby) differed from contemporary European Mini practice. Significant changes came with the adoption of 13 inch wheels. The wheel track was increased, so the wings were widened by about 4 cm (the extensions are visible additions). A restricted steering rack was fitted, so the tyres would clear the inner wheel arches (but sometimes tyre choice and aging suspension can still result in some rubbing). At the rear, longer ‘radius arms’ were fitted to move the wheels rearward in the Moke body (this was necessary so the tyres wouldn’t foul the pivots at the front of the radius arms). The longer radius arms were unique to these Australian Mokes. Moving the wheels rearward meant the rear panel had to be revised with special flared sections behind the wheels. Note: You may wonder about how Mini saloons can be fitted with 13 inch wheels without so much fuss. In fact those Minis have low profile tyres, making the overall diameter of the wheel and tyre combination is not much different; whereas the Mokes used full sized tyres. In any event, 13 inch wheeled Minis still need body modifications, plus a restricted steering rack and raised rear suspension. Other changes accompanying the upgrade to 13 inch wheels included the addition of deflector screens either side of the windscreen (initially these were Perspex, but were later replaced with metal-frames glass). Flexible rubber ‘spats’ were fitted to the wheel arches. Brackets gave them a ‘flared’ appearance. The fixed grille inherited from the English Mokes stayed until 1977 when it was replaced with a removable grille (giving easier engine access, especially to the distributor). A ‘pick-up’ Moke with a drop-sided demountable load ‘tray’ mounted where the rear seats would be (and overhanging the back of the car). There was a simple canvas roof over the front seats. Like the English Mokes, these were straight tubes at each end on the standard Mokes. But the triangular brackets used on English Mokes to bolt the front bumper to the front panel were changed to ‘legs’ which passed through oblong holes in the front panel and were bolted to the sub frame. On the ‘Californian’ Mokes, the straight tube bumpers were replaced with large ‘roo’ bars front and rear. Following the English pattern, this was mounted in the left-hand ‘pannier’, with the filler cap on the top surface. Later, the filler cap was moved to the outer side of the pannier and the tank was also made bigger. This design was used for all subsequent Mokes (including the Portuguese). A brief exception, however, was the early Californian (or ‘Export’) model, made between 1971 and 1973, which had its tank under the rear load area and its filler in the rear panel. The ‘regular’ Californians (introduced in 1977) had their fuel tanks in the normal position, in the side pannier. 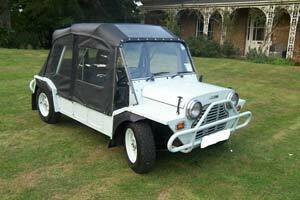 You’re lucky if you own an Australian Moke built from November 1979, as these used zinc-galvanised steel. Although it is possible you might get a bit of corrosion in the joins (and care is needed with resprays, as a paint reaction can occur) - the bodies of these Mokes are usually amazingly solid! Indicators and side lights are in one oblong unit, the outer 2/3 is for the indicator, the inner 1/3 is for the sidelight. The English-style round lamps and round reflector were replaced in due course with a with an oblong unit like the one at the front, but red/amber instead of white/amber. Later, there was a square-shaped combined unit (made by ‘Hella’). Seats: the first Australian seats were made of steel tubing with pads stretched across the seat and back. The padding was improved in later versions, but in due course high back seats of conventional construction appeared. Steering wheels were large 2-spoked plastic wheels, similar in size to the English wheels but different in style. Sports-style steering wheels with 3 alloy spokes were also offered on some Mokes. The ignition key switch was on the steering column. Some models also had a small square hooded ‘park brake’ and ‘brake fail’ warning lamp in the top right side. A multifunction stalk is fitted to the steering column with the horn push at the end and switching between dip/main beam obtained by pushing the stalk away from you or towards you. There was no ‘flash’ facility, however. A parcel shelf was fitted on either side of the instrument panel. If fitted, the heater was a bulky unit under the instrument panel with a large ‘hair-drier’ style fan under the passenger’s parcel shelf. Twin wipers, but not with the usual flexible ‘rack’ drive, Instead the wipers were driven by rigid rods from a small, neat, motor at the right hand end of the dashboard (inside the car). Rectangular mirrors were fitted on horizontal tubes fixed just below the windscreen bottom rail. Australian Mokes imported new by Runamoke were fitted with mirrors on upright stems mounted on the sloping part of the front wings. A central rear view mirror was bolted to a triangular tab on the upper windscreen frame. Different styles of hoods were offered by the factory, usually with roll-up side-screens. All Australian hoods were mounted on folding ‘hoops’ (like on English Mokes), which meant the hood could be folded right down behind the rear seats. like a convertible. The main hoops were much like the English main hoops, but there were different versions for rear. From 1977, Australian Mokes were offered with Roll Cages. These were full-height just behind the front seats, but the legs to the rear were lower so that the hood could still be folded down. On Mokes with the petrol filler cap on top of the pannier, the front-left roll cage leg had a kink near the bottom to clear the cap. Roll cages meant that it was possible to have 3-point inertia-reel seat belts for the front seat occupants.